Looking for a dish that is fit for celebrations? This smoked salmon and lobster tail bisque is as delicious as impressive looking. Best of all, it comes together in only 30 minutes. It’s a perfect starter course for New Year’s Eve, a dinner date or any special occasions. For years, we’ve stayed home on NYE because of my husband’s job. As a fire investigator, he rotates his on-call duty and somehow he always gets NYE. It would really stink if he had to leave mid-celebration. So, we rather not take the risk and we stay home. But, we always make the night special with good food. Good food fixes everything, right? This year, we’ll start the night with this yummy smoked salmon bisque. Husband is extra lucky because I’m not a lobster fan so he’ll get mine. For the second course, I’ll be dipping crusty bread into mushrooms julienne and he’ll get Spanish garlic shrimp (I don’t like shrimp either). For the main dish, we’ll have veal rollups with smoked cheese. Let’s just hope my husband doesn’t get called for an investigation because that would be too much smoke for one evening, ha. How do you celebrate NYE? Do you get together with friends, go out, or stay at home? Preheat oven to 375 degrees Fahrenheit. With a sharp knife, cut lengthwise through the top of the lobster shell starting from the base and going toward the end of the tail. Remove the digestive tract once you’ve cut through the shell (the dark-colored vein that runs along the length of the tail). Carefully pry the shell open with your hands. Starting at the base of the tail (the wide end), begin carefully loosening the meat from the bottom of the shell, but be sure to keep the meat attached at the tail end of the shell. Lift the meat through the opening and place it on top of the shell. Place the tails on a baking pan. Rub the meat with olive oil or butter and sprinkle with paprika, salt, and pepper. 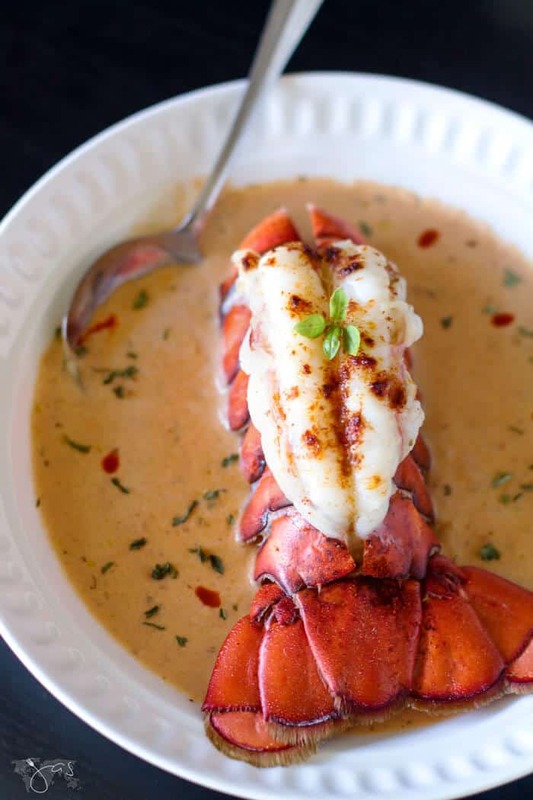 Bake the tails for exactly 1 to 1 ½ minutes per ounce or until lightly browned and lobster meat is opaque. Drizzle lobster tails with fresh lemon juice if you prefer. Add your favorite hot sauce to the soup if you like it spicy. In a saucepan, melt the butter over medium heat. Add leeks and garlic and saute until leeks are soft. Add the clam juice, smoked salmon, crushed tomatoes, parsley, dill, pepper, smoked paprika, Old Bay seasoning, and red pepper flakes. Cook until heated through. Put flour in a small bowl. Slowly add the milk, beating with a wire whisk until smooth. Mix in the heavy cream. Stir the mixture into the soup. Add fresh salmon and salt and simmer for 10 more minutes. Using an immersion blender or a food processor, purée the soup until smooth. You can leave some chunks or not purée at all if you like chowder-like soup. If using frozen, taw your tails by dropping them into cold water for at least 30 minutes. You’ll know that the tails are ready when they feel flexible. Preheat oven to 375 degrees Fahrenheit. Next, with shears or a sharp knife cut lengthwise through the top of the lobster shell starting from the base and going toward the end of the tail. Then carefully pry the shell open with your hands. Starting at the base of the tail (the wide end), begin carefully loosening the meat from the bottom of the shell, but be sure to keep the meat attached at the tail end of the shell. Next, lift the meat through the opening and place it on top of the shell. Place the tails on a baking pan. Rub the meat with olive oil and sprinkle with smoked paprika for great flavor and color. Bake the tails for exactly 1 to 1 ½ minutes per ounce. You’ll know that tails are done when the meat is white and firm with no gray coloring or translucency. Serve the tails with bisque and melted butter. This smoked salmon and lobster bisque is delicious, impressive looking, and it comes together in only 30 minutes. Featured on: A Mama Tale, Sunny Simple Life, The Life of Jennifer Dawn, Keeping It Simple, Tabler Party of Two, and Carrie’s Home Cooking. This looks like a fabulous special occasion bisque. My family is Italian and we celebrate the Feast of the 7 Fishes on Christmas Eve. I love the idea of making this as part of that meal. Thanks for the recipe. Pinned it! This dish looks fantastic!!! This will be a sure hit in every home. Thanks for sharing! Oh my! What a deliciously decadent treat this would be. I’ll have to keep my eye on lobster prices. 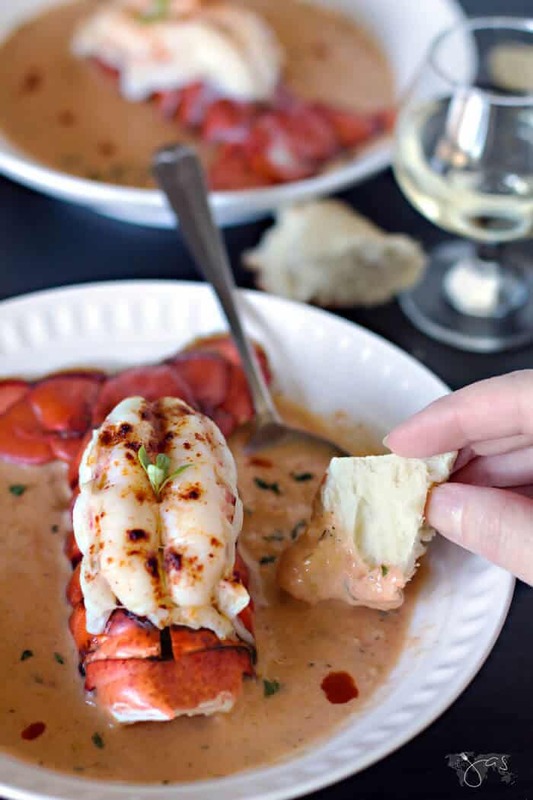 I love lobster and I love bisque so I will definitely try this one out while the weather still allows us to enjoy a nice hot soup. But I’m intrigued – why would you go through all this trouble to make something you don’t like eating? Especially on NYE. Well, whatever…. Wish you well for the new year though and hope you get to eat what you really love. I appreciate your honesty! 😀 I also appreciate food even if I don’t personally like it. Cooking is never a trouble for me (OK, sometimes it is, lol) and if my husband likes it, I’m making it. I wouldn’t withhold good food from him or my readers just because I don’t like it. 🙂 Hope that makes sense. In this case, it’s just a lobster. I LOVE the bisque. Thanks for stopping in and happy holidays! OMG, I shouldn’t have visited you on an empty stomach. This bisque looks delicious. Perfect comfort food that I will be treating myself to. I’m Pinning this one! Thanks for sharing on Sunday’s Best. Oh, my goodness, JAS!! My hubster and I are going to be alone on New Year’s Eve, and we’ve been feverishly planning out what we’re going to eat. (I think we’re up to about 30 things now??? HA!) THIS looks like the most amazing thing to kick off our epic NYE dinner. Lobster bisque is my FAVE!! Sounds like you’ll have a feast! I’m coming over and bringing my fork, ha! This bisque has truly an amazing flavor. Hope you like it. 😀 Happy holidays! Such as elegant salmon bisque topped with a lobster tail. I love both but never had them together like this (I would eat your lobster tail). Lovely presentation and a dish I would enjoy serving to someone special. Thanks for sharing your bisque with Fiesta Friday! Thank you, Judith! I appreciate your kindness. 😀 Happy holidays! Awe, I appreciate that very much! 😀 Thanks for stopping in and happy holidays! Mmmmmm. This looks so good! We stay in on NYE too, though more because of the little ones. Definitely going to save this recipe for the day when we can stay home to enjoy each other’s company. Thanks so much for sharing at the #happynowlinkup! Thank you, Leslie! Hope you won’t have to wait too long before you can try it. 😉 Wishing you happy holidays! Oh Goodness! I’m drooling so much right now. This looks absolutely amazing. This will be a very special dish for a special evening Jas. 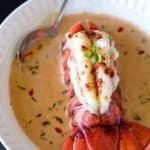 I just pinned it and will be making this very soon, I love Lobster Bisque, I am drooling! Hope you have a fantastic week and thanks so much for sharing with us at Full Plate Thursday! Thank you, Miz Helen. It sure is very tasty. Thanks for the 5-star review too! So luxurious!! Mmmmm 🙂 Thanks for sharing at Friday Frenzy Link Party! PINNED! Wow. This makes me hungry. Thanks for joining the To Grandma’s House We Go link party! Glad to hear! Thank you!!! I’m thrilled you love it! Thank you for the review, Amber! Thank you so much! What an honor. 😀 Wishing you a wonderful holiday season! Totally amazing recipe. This is chef quality cuisine, so beautiful.